The authors of the same paper(s) also must have sent it to Dr Lisle for a review. He sent me his response to their paper(s) and I publish it below with his permission. I just hate to be the bearer of bad news, but none of the arguments in your article actually establish the one-way speed of light. In all cases there is one or often several mistakes in reasoning, especially the petitio principia. These errors fall broadly into three categories, which I will address below. Again, I highly advise you to read the technical literature on this topic, because many fine minds have written extensively on it, and this would give you a better understanding of the issues involved. A literature review is always a good first step when thinking through the implications of a particular hypothesis. What you are attempting to do is to refute what physicists call “the conventionality thesis of distant simultaneity.” The conventionality thesis is the proposition that nature does not prefer one convention of simultaneity over another: that any definition of “simultaneous” with a Reichenbach synchronization parameter between 0 and 1 is allowable. Your view would be called the “anti-conventionality” position and in particular you are arguing that the only legitimate convention of simultaneity is the “standard signal synchrony” in which the one-way speed of light is the same in all directions and the Reichenbach parameter is ½. The conventionality thesis actually follows logically from the relativity of simultaneity, as demonstrated by Michael Redhead in his paper “The conventionality of simultaneity” (1993). This is why physicists who accept the physics of Einstein almost always also embrace the conventionality thesis. Einstein himself held to the conventionality thesis as I pointed out previously. And many other physicists have published proofs of the thesis. Have you read these? If so then you really should address them in your article, and why you believe them to be flawed. For example, have you read Arthur Eddington’s detailed work in support of the conventionality thesis in Space, Time and Gravitation (1920) or his more thorough treatment in The Mathematical Theory of Relativity (1932)? If so, what error(s) do you find in his analysis? Eddington pointed out that “a convention is introduced as to the reckoning of the time differences at different places; this convention [stipulates that] the forward velocity of light along any line is equal to the backward velocity.” He continued to state that the isotropy of the one-way speed of light is not “by itself a statement of observable fact, nor does it refer to any intrinsic property of clocks or of light; it is simply an announcement of the rule by which we propose to extend fictitious time-partitions through the world.” That is why it is conventional and thus other options are allowable. In your article, you made no mention of Reichenbach’s seminal work on the conventionality thesis in his Axiomatization of the Theory of Relativity. Nor do you mention his less formal treatment on the topic in The Philosophy of Space and Time (1928)? Are you familiar with these? It’s a bit odd that you have not even mentioned these proofs since you are attempting to refute them. In his 1922 essay “On the present State of the Discussion on Relativity”, Reichenbach states, “It would be a mistake to believe that the definition of simultaneity given in the special theory of relativity [ESC] claims to be ‘more correct’ than any other definition of simultaneity” [such as ASC]. The fundamental reason why the convention cannot be disproved is because ESC and ASC are merely different (and interconvertible) coordinate systems and anything that can be expressed in one coordinate system can be expressed in another, even though the formulae may differ. Kinematically, the reason for the conventionality of distant simultaneity is that light is a “first-signal” and therefore there is no way to synchronize distant clocks without knowing the one-way speed of light, and there is no way to empirically measure the one-way speed of light without synchronized distant clocks. The problem does not occur when measuring the round-trip speed because only one clock is needed. Grunbaum has written extensively in defense of the conventionality thesis, yet I noticed that you didn’t mention any of his papers in your article. His 1955 paper on the topic addresses how the conventionality of distant simultaneity follows from the relativity of simultaneity. He followed Einstein’s illustration of the relativity of simultaneity with the passenger on the train who observes two lightning strikes that are simultaneous from the point of view of a stationary observer, in which the observer on the train does not consider the strikes to be simultaneous under the epsilon = 1/2 (ESC) convention. He then asks whether “the train observer’s observations of the lightning flashes compel him to say that the bolts did not strike simultaneously?” He answers, “Decidedly not!” (This is because the observer might allow the one-way speed of light to be different in different directions.) He explains that “It follows that it is the relativity of simultaneity within each inertial system which allows each Galilean observer to choose his own value of epsilon so as to agree with other observers on simultaneity or so as to disagree.” In his book (Philosophical Problems of Space and Time, 1963) Grunbaum shows that the observer on the train can allow the same hyper-surface of simultaneity as the stationary observer by a suitable choice of epsilon (a non-ESC system). In 1963, W.F. Edwards published a ground-breaking paper on “Special relativity in anisotropic space” in which he showed that the Lorentz equations can be generalized to allow for non-isotropic light propagation in a way that is observationally indistinguishable from the standard signal synchrony. He concludes that no experiment in special relativity could ever disprove the conventionality thesis. Are you familiar with this paper? Since you are attempting to refute it, I suggest that you at least address the paper and point out what you perceive to be its flaws. John Winnie’s papers in 1970 which I mentioned previously showed that special relativity can be expressed without any one-way assumptions. His equations (the epsilon-Lorentz transformations) show that non-standard synchrony conventions produce results that are observationally identical to the standard synchrony convention. As Winnie put it, “any kinematical experiment which results in the disconfirmation of the epsilon-Lorentz transformations, when a particular value of epsilon is chosen, disconfirms all permissible choices of epsilon, including epsilon = ½.” Carlo Giannoni (as mentioned previously) and Abraham Ungar (independently, 1986) also derived the epsilon-Lorentz transformations. In 1977, Wesley Salmon published a brilliant paper in which he defended the conventionality thesis, and refuted a dozen or so of the published arguments against conventionality (“The philosophical significance of the one-way speed of light” Nous 11, 1977). I read this paper about 20 years ago, and found it extremely compelling. Salmon concludes that “the evidence, thus far, favors those who have claimed that the one-way speed of light unavoidably involves a non-trivial conventional element.” If you haven’t read this one, I would highly recommend that you do. It addresses in principle most, if not all, of the kinds of arguments you have attempted. Subsequent publications addressed details such as the transitivity of ESC and that of non-standard synchrony conventions. These included contributions by Jarrett Leplin (“Synchronization rules and transitivity,” 1976), Russell Francis (“On the interpretation and transitivity of non-standard synchronisms,” 1980), and Leo Karlov (“Clocks in nonstandard synchrony”, 1987). Have you read these? I ask because none of them were mentioned in your article. T. Sjodin presented proof of the conventionality thesis in his 1979 paper “Synchronization in special relativity and related theories.” M.P. Podlaha also claimed to prove the conventionality thesis in his 1977 paper, “On the impossibility to measure the one-way velocity of light.” Since you disagree, I must ask what part of their analysis do you believe to be mistaken? I suggest that your article needs to address these papers so that readers will not have the impression that you just haven’t done your homework in this topic. I admire your boldness in attempting to take on Einstein, Eddington, Reichenbach, Edwards, etc. But I do think you need to address at least some of these since you are attempting to refute them. Max Jammer wrote a book “Concepts of Simultaneity” (2006) on the topic that gives a very good historical overview of the conventionality thesis, and the concept of simultaneity in general both before and after the development of relativity. It does not contain much in terms of the technical details, but will point you to the relevant papers, only a few of which I have mentioned above. Don’t misunderstand; the standard signal synchrony is an acceptable choice, and most physicists (myself included) prefer to use it when doing computations because it is symmetric and transitive and the imposed symmetry makes the math easier. By analogy, we tend to use spherical coordinates rather than rectangular when expressing the Schwarzschild metric – simply because the math is easier. But the vast majority of physicists (myself included) agree with the conventionality thesis – that other conventions of simultaneity with a Reichenbach parameter between 0 and 1 are equally legitimate, even if formulae take on a more cumbersome appearance. But there have been other dissenters who have attempted refutations of the conventionality thesis, sometimes along with the rest of relativity. But none of them (so far) have succeeded. In all cases, their analysis committed one or more of the same errors present in your article, and these were pointed out by physicists in later papers. For example, James Jeans (1921) supposed that experiments performed by Quintilio Majorana could be used to measure the one-way speed of light. But this was refuted by a physicist named Bartrum (1921) who then concluded, “I venture to suggest that these experiments do not bear the interpretation that Mr. Jeans puts upon them, and that the experiment has not yet been devised that will enable a comparison to be made between the velocity of light on its outward and return journeys along the same path, or that will give a measure of the velocity on a single journey…. I fear such an experiment is impossible.” [emphasis added]. Physicist Halmar Melin rejected the conventionality thesis (along with the rest of relativity) and in 1926 he argued that simultaneity is absolute. He provided a thought experiment in which rods moved past each other such that their edges matched at the same time as confirmed by sensory experience. But of course, Reichenbach himself refuted this (also in 1926) by pointing out that Melin had assumed a convention of simultaneity when he said “at the same time” and furthermore that sensory experience is transmitted in a way that depends on the speed of light. Philosopher Arthur Lovejoy thought that he had disproved the conventionality thesis (along with the rest of relativity) in 1930. He argued against Einstein’s relativity of simultaneity as illustrated in the lightning bolts and moving train thought experiment. Lovejoy argued that the moving observer should also realize that the bolts are simultaneous but that he sees light from one before the other because he is no longer in between them but has moved closer to one. His error was in failing to work consistently within the train’s coordinate system; namely the observer in the center of the train is still midway between A’ and B’, even if he is not midway between A and B. Have you read this paper? Kenneth Durbin (1964) thought that he had disproved the conventionality thesis by establishing a synchrony convention without assuming the one-way speed of light. But his thought experiment relied upon the Lorentz transformation as expressed in ESC coordinates. He commits the very petitio principii mentioned by Reichenbach. Consequently, his paper was rightly criticized by Francis Sears who then offered his own method of synchronizing clocks that was supposedly independent of one-way assumptions. But Sears’ paper also begs the question because the method relied upon measuring the times of a rod moving at a known velocity v. However, to measure a velocity requires a convention of simultaneity just as Reichenbach so eloquently explained back in 1925. In 1976, G. Burniston Brown attempted to refute Einstein’s conventionality thesis by appealing to Romer’s 1676 observations of Jupiter’s moons. He states, “One of Einstein’s most extraordinary errors was the statement that we only know the mean two-way velocity of light (i.e. up to a mirror and back) so light might, for instance, go quicker one way than the other. The fact is, however, that we have known the one-way velocity of light since the very first time this velocity was measured, in 1676, by the Danish astronomer Romer.” Louis Essen also argued this way (1969). But of course, both had tacitly assumed ESC in their argument, thereby begging the question (as I demonstrated in my book). Further, the Australian physicist Leo Karlov in 1970 published a detailed mathematical analysis of Romer’s procedure, and showed that it does not refute the conventionality thesis. He stated, “the method of Romer (as indeed all observational methods of finding the speed of light) can only supply an objective average speed in a closed path.” Have you read any of his work? But his analysis was flawed. The hidden assumption is that the nodes only occur if the speed of light is the same in both directions, and he failed to work through the math to see what would happen if the speed of light differs in each direction (an error of type 3 below). This seems to be the very assumption you made when asking about standing waves. But of course, if you use a non-standard convention such as epsilon = 0 (or any other), and do the math properly, the nodes occur in exactly the same locations. Thus, the experiment cannot distinguish between the standard signal synchrony and any other. A detailed refutation of Liebowitz was produced by Grunbaum in 1956, and later by Wesley Salmon in 1977. Shing-Fai Fung and K.C. Hsieh (1980) even worked out the details showing that the nodes actually measure the average of the incoming and outgoing wavelengths: lambda = 2((lambda_in)^-1 + (lambda_out)^-1)^-1. They correctly conclude “the above argument precludes any possibility of determining the anisotropy in the speed of light by means of interference between a light wave and its reflection, thus giving support to the conventionality thesis.” Have you read any of these papers? In 1977 David Malament published a paper in which he attempted to refute the conventionality thesis. This paper is probably the most well-known anti-conventionality paper. But his argument was shown to be flawed because Malament had made two false assumptions. The first was exposed by Russell Francis in 1981. Francis showed that Malament had assumed in his argument that nonstandard synchrony conventions must be transitive everywhere. But this is not so. Some are transitive and some are not. The more serious error was exposed by Allen Janis in his 1983 paper “Simultaneity and Conventionality.” Janis showed that Malament had arbitrarily assumed symmetry in his argument, thereby committing the petitio principii. Since epsilon=1/2 is the only symmetric simultaneity relation, to require symmetry “is not very different from requiring equal speeds of light in opposite directions.” This fatal error was exposed independently by Grunbaum, and Norton, and also by Sarkar and Stachel (together). Michael Redhead, while accepting aspects of Malament’s argument, nonetheless refuted Malament’s conclusion by pointing out that even the standard synchrony convention involves an aspect of conventionality; two observers in relative motion have two different, yet equally legitimate hypersurfaces of simultaneity. The is no a priori reason why the one observer may not use the hypersurface legitimately defined by his moving counterpart. Indeed, “any procedure of establishing standard simultaneity in a moving reference system automatically defines a nonstandard simultaneity in a stationary system” as Max Jammer (2006) so concisely stated. George Stolakis attempted to refute the conventionality thesis in 1986 using a thought experiment in which two light beams are sent along two paths through a medium and then reflected back through vacuum. But in fact, this type of experiment had already been refuted in Salmon’s 1977 paper. Stolakis was apparently unaware of Salmon’s analysis. Furthermore, in 1989 Robert Clifton provided a very detailed refutation of Stolakis’s claim, including a derivation of Snell’s Law for non-standard synchrony using Fermat’s Principle. He concludes that experiments “involving regions of space with varying refractive indices, cannot ‘single-out’ any factual values of the Reichenbach-Grunbaum epsilon factor thus posing no threat to the conventionality thesis.” Independently, Vesselin Petkov also analyzed and refuted Stolakis’s argument in 1989. Have you read any of these papers? R. de Ritis and S. Guccione thought that they had found a way in principle to measure the one-way speed of light in 1985. Their thought-experiment consisted of light beams along a triangular path, similar in some ways to the first thought experiment in your write-up. They concluded that epsilon must equal 1/2, but their analysis was doubly flawed. First, they had assumed that synchrony conventions must be transitive, which is not generally true for non-standard conventions. So, their assumption is essentially equivalent to assuming epsilon = ½, the very thing they were attempting to prove. Further, they failed to notice that a class of non-standard synchrony conventions will also balance all the equations. They had more variables than equations, hence a unique solution is not possible. Their paper was thoroughly refuted by Peter Havas in 1987. Since this is similar to your approach in the first thought experiment, is there a reason you didn’t mention these papers? And yes, there have been a handful of arguments that attempt to use rotating disks or their equivalent to measure the one-way speed of light. These are called “shaft synchronizations.” One of the earliest of this type was proposed by Carl Benedicks in 1922. He thought he could absolutely synchronized two distant clocks, which could then be used to measure the one-way speed of light. He wrote, “We say that two distant clocks are synchronous, provided that their hands are moving as though their axles were connected by one rigid axle, consisting of an absolutely solid body.” The problem of course is that relativity disallows an “absolutely solid body” (infinitely rigid matter). Pushing on a rod at one end does not cause the other end to instantly move; instead the signal travels at the speed of sound in the material, which subtly depends on the one-way speed of light. A similar mechanism was proposed by Albert Eagle in 1938. His thought experiment connected the hands of two clocks by a long shaft. A motor exactly in between the two clocks turned the shaft. Eagle was aware of relativity and took into consideration Lorentz contraction; but he neglected to include the twisting of the shaft that necessarily occurs in all nonstandard synchrony conventions. Eugene Freenberg published a paper in 1974 describing a thought experiment to supposedly measure the one-way speed of light that is very similar to Ahmed et al. However, these experiments have been refuted as tests of the one-way speed of light because they all tacitly assume ESC by neglecting the twisting of the rod. 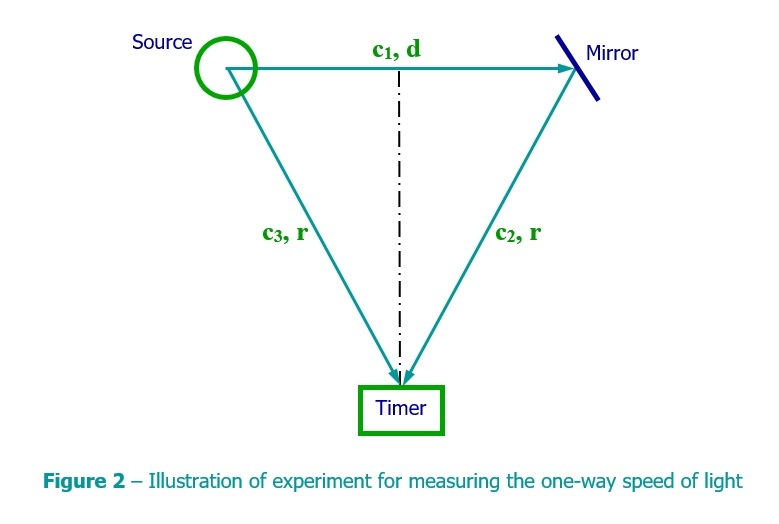 Peter Ohrstrom in his 1980 paper “Conventionality in distant simultaneity” demonstrated that shaft-synchronization experiments cannot establish the one-way speed of light. Are you familiar with his paper? I would have thought it would answer your questions about Ahmed’s proposal even if the explanation in my book was not sufficiently clear. Though they cannot measure a one-way speed, shaft-synchronizations can indeed measure the round-trip speed of light as was done by H.L. Fizeau in 1849. Einstein certainly held to the conventionality thesis even though he preferred to use the standard signal synchrony (as do I). He stated that the one-way speed of light was a free choice in order to arrive at a definition of simultaneity, and not a supposition nor a hypothesis about the physical nature of light. Interestingly, Einstein himself endorsed ASC (i.e. the surface of the past light cone is taken as the hyper-surface of simultaneity) as a legitimate convention of simultaneity. He wrote special relativity in the ESC coordinate system because ESC is velocity-based whereas ASC is position-based. This was pointed out by Sarker and Stachel in their paper on the topic, which I mentioned in my last message to you. Your article gives the impression that ASC is my invention. It isn’t. The ASC system is well established in the secular technical literature. I summarized the reasoning for it in my paper because most creationists are not knowledgeable of relativity. My modest contribution is to argue that the Bible uses this convention and to point out that this eliminates the supposed distant starlight issue. I also coined the moniker “ASC.” But as I mentioned above, Einstein himself considered ASC a legitimate convention. More recently, the advantages of using the past light cone as the surface of simultaneity were illustrated by Sarkar and Stachel (1999) in the paper that I mentioned previously. Did you read it? Have you contacted them to point out what you perceive as errors in their analysis? Is there some reason you have not chosen to publish your rebuttal of Sarkar and Stachel in the standard technical literature where it would get a much more robust peer-review than it would in the CRSQ? 1. Using a formula that is only valid in ESC coordinates, and fallaciously using it with ASC without doing the proper conversion. Many formulae in physics can be expressed in several ways and take on a different form when expressed using a different coordinates system. Wein’s law, for example, will not work without conversion if you use any temperature scale other than Kelvins. But that doesn’t “disprove” the Celsius or Fahrenheit conventions. The Schwarzschild metric takes on a very different appearance when expressed in different coordinate systems. This is your error in section 2 where you claim that Maxwell’s equations demonstrate that electromagnetic waves must propagate at speed c in any direction. That is only true if you use the differential ESC version of Maxwell’s equations (which tacitly assume symmetry). So your error here is the petitio principii. But if you do not assume isotropy of light, and you derive Maxwell’s equations in differential form, then the wave equation gives DIFFERENT speeds in different directions, as Carlo Gionnani demonstrated in 1978. His equation 51 clearly shows that electromagnetic waves do not generally propagate at the same speeds in all directions unless epsilon = ½, as I mentioned previously. Did you understand this? Did you read the paper? So your argument in section 2 was thoroughly refuted forty years ago. In order to use an equation to supposedly refute ASC, you must first demonstrate that the equation itself does not depend upon ESC. That’s not always easy to do because we often use formulae that are coordinate-dependent. By analogy, such an argument is like saying that polar coordinates are wrong because the formula for a straight line (y = mx + b; r = m*theta + b) doesn’t even produce a straight line when plotted in polar coordinates! Well, the formula for a straight line is different in polar coordinates. In general, if you are going to use a formula in physics, you need to demonstrate that the formula itself does not assume ESC, or explicitly convert the formula to ASC coordinates yourself. Your error in using the wrong version of Maxwell’s equations in section 2 is carried over into section 5. Likewise, in section six you use several formulae without giving any proof that they are independent of synchrony conventions. In order for this section to be rationally cogent, you must demonstrate that none of these formulae assume ESC. It begs the question to use a formula derived in ESC coordinates, and use it (without proper conversion) in ASC coordinates, and then complain that it gives the wrong answer. For example, what is the formula for momentum in ASC coordinates? Were you thinking it is p = mv as it is in ESC? But velocities are different in ASC coordinates than in ESC coordinates. So v_ESC ≠ v_ASC in general. All one-way velocities (not just the speed of light) are dependent on the choice of synchrony convention. 2. Assuming a symmetry that exists only if the one-way speed of light is isotropic (thereby begging the question). For example, your argument regarding reflection of light fallaciously assumes that wave fronts of light must be orthogonal to the direction of propagation. This is only true in ESC due to its imposed symmetry, and not generally true in other conventions of simultaneity. This is proved in section 4 of Gionnoni’s paper. Hence, your figure 3B is wrong because you portray the wave fronts as orthogonal to the propagation direction. Your error here is then carried into section 4. I even gave you the formula for the angle of wave fronts relative to propagation direction under ASC so you could check for yourself and confirm that the angle of incidence will still equal the angle of reflection under ASC. 3. Failing to consider any alternative coordinate system and work through the math consistently within that system to show that it gives an observationally different answer. This is the problem with your first argument (and to some extent with your fourth as well). As I showed, when you use an alternative synchrony convention consistently, it gives the same answer as ESC. (By the way, this is always the case because ESC and ASC are merely different coordinate systems for describing the same phenomena.) I appreciate that you have revised this section, but it’s not enough. You say, “There is one notable alternative possibility, characterised by the proposal that c = c0/(1 – cos theta)…” But in fact, there are an infinite number of alternatives as Peter Havas demonstrated in 1987. You just haven’t considered them. That’s where it would have been helpful for you to read up on the literature. Your analysis of relativistic time-dilation commits all three of these fallacies. Your figure 5 is incorrect because the angle of incidence must equal the angle of reflection in ASC (as well as in ESC), which is an error of type 2 as we saw previously. But you haven’t actually worked through the math to demonstrate the reverse, which is an error of type 3. Your confusion about the position of the mirror is also due to an error of type 2, because you have assumed that the train does not shear in the horizontal direction. A lack of shearing for a moving object would only make sense if the propagation speed of the electromagnetic bonds is the same in all directions, i.e. in ESC coordinates. In relativity, you may not assume that a moving object has the same shape as its stationary twin (e.g. length contraction will reduce a sphere to an oblate spheroid even in ESC, and additional distortions occur in nonstandard synchrony conventions). That moving objects unsheared in ESC must be sheared in ASC should be obvious. Consider the trailing edge of the last rectangular box car of the train. If unsheared, the top and bottom of this edge will pass a given x coordinate at the same time. But ESC and ASC differ on what constitutes “at the same time” for two objects separated by a distance. That’s the whole point of a synchrony convention. Thus, if the top and bottom have the same x coordinate at the same time by ESC, then they will not (in general) have the same x coordinate at the same time as by ASC, and vice versa. You can easily convert from ESC coordinates to ASC or vice versa using the formula I provided in my book (18.2). Of course, the answers you get for time dilation, length contraction, spacetime interval, etc., are correct but only when expressed in the ESC coordinate system, which is an error of type 1. The general equations for time dilation, length contraction, etc. which do not assume a synchrony convention are given in John Winnie’s 1970 papers (e.g. equations 4-9, 3-9). Your comment “I am amazed that the mechanical properties of the rod and friction in the apparatus play no special part in determining this twisting” is an error of type 2 and type 3. By assuming that no twisting occurs, you are assuming a symmetry that only exists under ESC (and ONLY in the stationary frame I might add). And you didn’t work through the math to see what the results would be under ASC. The issue has absolutely nothing to do with friction, or mechanical properties per se. It has to do with the definition of distant simultaneity. Any two moving objects, such as holes in disks or whatever, are “aligned” along x if they have the same spatial coordinates in y and z at the same time. However, ESC and ASC have a different definition on what constitutes “at the same time” for objects separated by a distance. Therefore, if the holes are “aligned” in ESC (same y and z coordinates at time t_ESC), then they will not, in general be aligned in ASC (same y and z coordinates at time t_ASC) because t_ESC does not equal t_ASC, except at r=0. This would also have to follow simply from the nature of matter. When we push or pull or rotate an object by pushing on some of its atoms, the other atoms respond by moving due to the electromagnetic bonds that hold them together. The change in electric potentials travels at the one-way speed of light. You have not adequately reflected upon how a solid will deform if the propagation speed of electric potentials is non-isotropic. Suffice it to say, it will not, in general, remain the same shape. You asked, “Have you got a full mathematical analysis that you could send me to prove your contention?” But the analysis is trivial. Just use equations 18.1 and 18.2 on page 247 of the book. If we use ASC and take the light to be infinite in the +x direction with the observer at disk B, and if the two disks are aligned in ESC at time t, and L is the distance between the disks and omega is the angular velocity, then disk A will lag in rotation behind disk B since t_ESC ≠ t_ASC. From 18.2 the time lag will be L/c where c (as always) is the round-trip speed of light. Thus, disk A will be twisted relative to disk B by omega * L/c radians. And of course, under ESC, there is no twisting (in the stationary frame), but the light takes time L/c to get from disk A to disk B in which the latter has turned omega * L/c radians relative to the former. The same answer. Richard, it has taken me a great deal of time to analyze the mistakes in your article and to write these responses. But I need to get back to my other responsibilities, and so I will not be able to give you any further detailed responses, at least not in this format. So please respect this and don’t ask, except for matters that will require only a *very* brief clarification. That being said, if you really do want a more in-depth explanation from me, then I suggest you go ahead and publish your article in the CRSQ and I will be very happy to publish a detailed refutation, pointing out your errors with much greater elaboration than I have done here, and citing the technical literature where these issues have been discussed for the past century. The response might take several papers actually. Though this will take time, it has the benefit that many people will see it and hopefully gain a better understanding of physics. Please do let me know if and when you plan to publish so that I can begin working on the refutation. Thanks! Also, if you wouldn’t mind, if you contact Sarkar and Stachel to point out what you believe to be errors in their paper defending ASC, do keep me in the loop. I would be curious to hear their response. Thanks so much for your interest in this subject and for contacting me. A fallacy in which a conclusion is taken for granted in the premises; begging the question. ← Sapphire clock wins the Eureka prize!